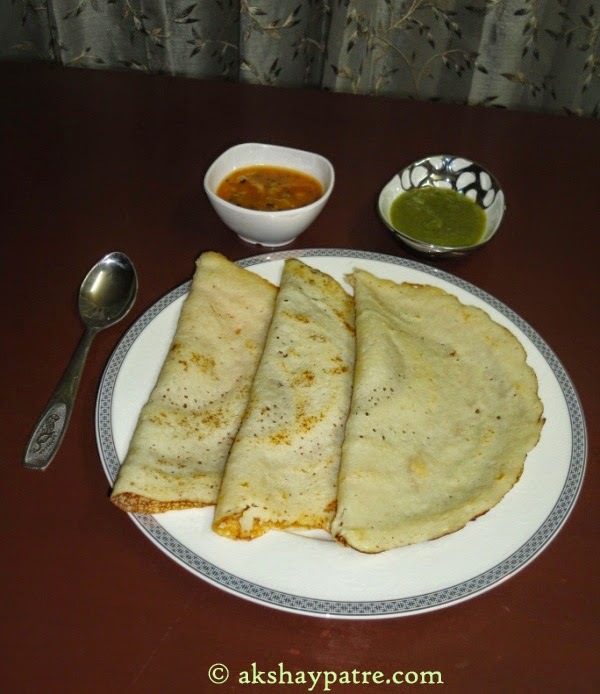 Rava dose recipe - Rava dosa is yet another breakfast dish of South India. For breakfast we look forward to prepare classic dishes to serve. This rava dosa has a great texture and softness that makes a splendid breakfast dish when accompanied with sambar and chutneys. This is a very simple and easy to prepare dish which is a time saver in the morning rush. This is a comfort dish that keeps your stomach full for at least two hours. This is an ideal dish for the beginners that they can prepare it very easily. This dosa batter doesn't need any fermentation. Once you make the urad dal paste, the roasted rava can be added to it and you can prepare the dosa immediately. This is an alternative to rice dosa. Wash and soak the urad dal for 3 - 4 hours. Drain the water and add fresh water and curd. Grind it to a smooth paste using required water. Roast the rava till raw smell disappears. Add this rava to the urad dal paste. Add salt and make a medium thick pouring consistency batter. You can add tempering made with mustard seeds, green chillies and curry leaves to it. Heat a non-stick pan and smear oil on it. Take a ladle full of batter and pour it on the griiddle. With the back of the same ladle, spread it thin and round. Cook the dosa till the base becomes light brown and firm. Then flip it and cook it for 1 - 2 minutes. 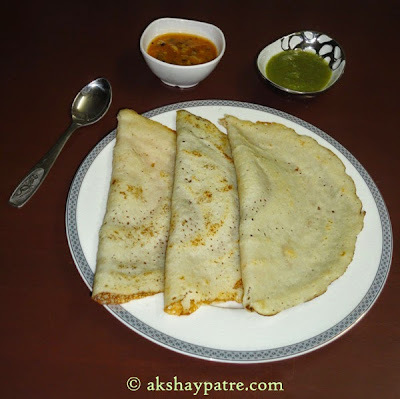 Serve the rava dosa hot with sambar and choice of your chutney. 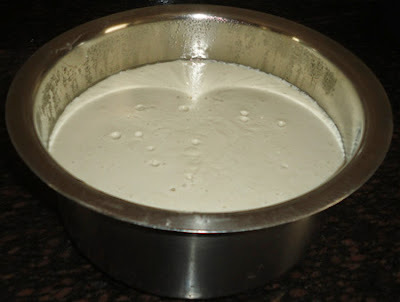 You can add the tempering made with mustard seeds, green chillies and curry leaves to the batter. But I have not added tempering to the batter. 1. Wash and soak the urad dal for 3 - 4 hours. Drain the water and add fresh water and curd. Grind it to a smooth paste using required water. Roast the rava till raw smell disappears Add this rava to the urad dal paste. Add salt and make a medium thick pouring consistency batter. 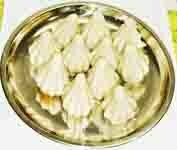 You can add tempering made with mustard seeds, green chillies and curry leaves to it. 2. Heat a non-stick pan and smear oil on it. Take a ladle full of batter and pour it on the griiddle. With the back of the same ladle, spread it thin and round. 3. Cook the dosa till the base becomes light brown and firm. Then flip it and cook it for 1 - 2 minutes. 4. Serve the rava dosa hot with sambar and choice of your chutney. So tempting .. want to eat them now. love to have dosa anytime!!! Lovely new recipe! I always made rawa dosa without dal. Thanks! My favourite dosa, can have it everyday.